Michael has begun the process of looking for our new home in Macau. Last week he looked at three places, and as I type this he's actually with a real estate agent looking at three more. Nathan's wish list: a high floor and a Very Big swimming pool. Benjamin's wish list: a swimming pool with the depth markers painted on the side so he doesn't go into the deep end unless he wants to. Are they easy to please or what? My wish list: four bedrooms and a great view. Yeah. If you remember, I LOVE the color green. LOVE it so much, I have to write LOVE in all caps! 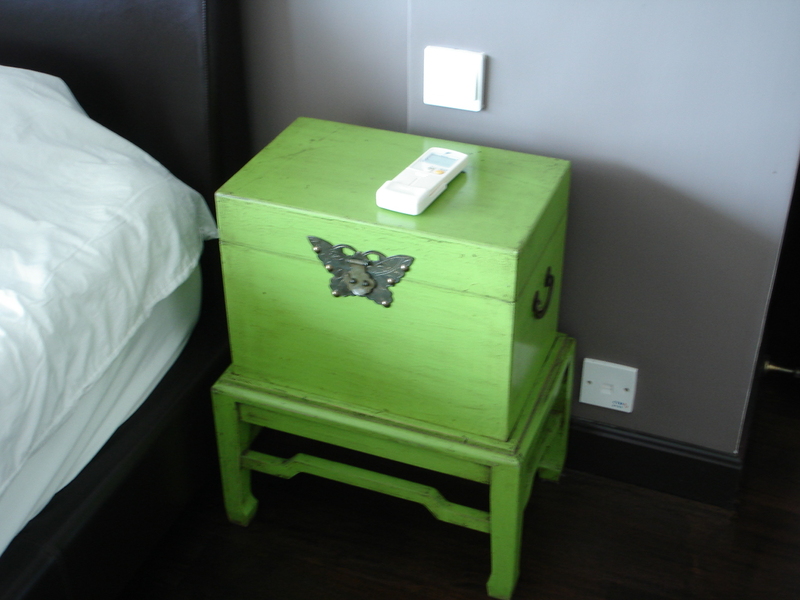 And if we were going to move into a place that Michael picked that I had never seen, then surely there could be no better place than one with gorgeous green nightstands. The red walls in the dining room. I lived in my first house until I was in the 5th grade (poor Nathan is in 4th grade and he's lived in EIGHT houses, it'll be nine in July!). My childhood house had a formal dining room, which we only used with company or for Sunday supper after church. I used to sit at a chair in the dining room and daydream of the day I would have my own dining room, which I would paint bright red. 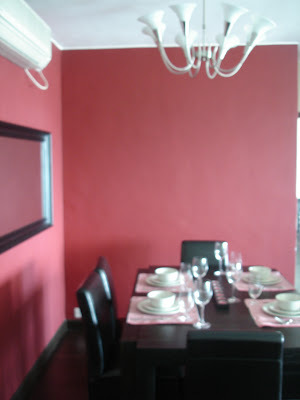 I never knew anyone with a red dining room, nor was I a particular fan of the color, I just believed that I wasn't really going to be grown up until I could dine in a red room of my own. Yet from the time I turned 18 and moved to Los Angeles on my own until this very day, I have only ever lived in rented dwellings. We've never owned our own home, primarily because we moved just too darn often, all over the world. And while we've had several wonderful landlords who let us change the standard Rental White paint, not one of them has ever been enthusiastic about red. So when Michael emailed me this photo back in 2008, I knew it was meant to be our home. There were other reasons to love this flat... it was on the 38th floor with absolutely stunning views and it came fully furnished except for one bedroom, which was perfect since we planned to ship over the boys bunk beds anyway. But the red walls... man, those were a dream right out of my childhood! When everything fell through and we ended up not moving to Macau back in 2008, I mourned for those red walls as much as I mourned the lost job and the lost chance to move out of the country. I'm confident that the right place will be there at exactly the right time for this current move, even if it doesn't have a red dining room. 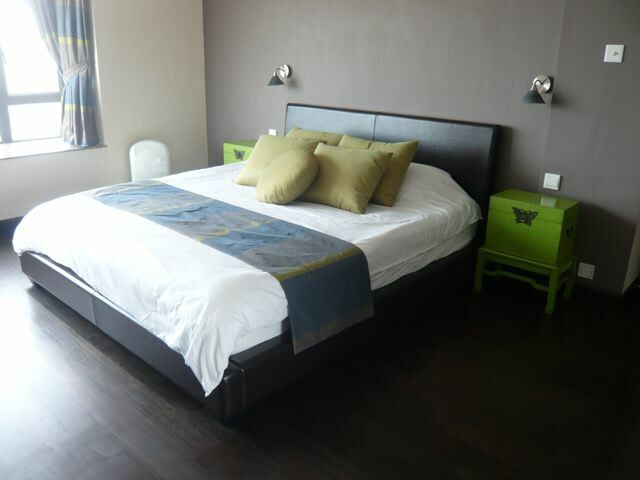 And all kinds of furniture is made right there in Macau (I'll bet you have something in your house right now that was manufactured in Macau), so if I want green nightstands, then I shall have them. The amazing thing is that housing prices have dropped in the three years since we were first going to move there. Our housing allowance will go so much further! I'll leave you with two quick videos. Back in 2008 when Michael was staying in Macau we didn't use Skype. Instead we'd leave video messages for each other on a now defunct photo sharing site. While looking for the photos of the flat above, I came across these videos of Nathan and Ben leaving messages for their Daddy. In them, Nathan is 7 and Benjamin turned 5 on the day of the video. Crazy how much they've grown up in three years! The sentiments they share for Michael are just as true today as they were back then! You'll also notice the bright blue walls... our landlord at the time was cool with blue, but not so hot about red!